Two out of our three chosen raisers raised their payouts by 10% or more. Last week, for the second week in a row, there were a raft of dividend raises coming from high-profile companies on the stock exchange. All three of my chosen trio for the period are components of the S&P 500, and leading stocks in their industries. Here are a few words about the latest distribution bumps from Honeywell International (NYSE:HON), Lockheed Martin (NYSE:LMT), and American Express (NYSE:AXP). Sprawling industrial powerhouse Honeywell, a frequent dividend raiser, is at it again. It's declared a 12% increase in its quarterly payout to just under $0.75 per share. The company's been humming along quite well recently, delivering a Q2 that modestly beat expectations. Sales increased marginally, by 1% on a year-over-year basis, to land at just over $10 billion. A hearty 30% rise on the top line for the safety and productivity solutions unit filtered down to help grow net profit by 5% to almost $1.4 billion. The company is predicting that its full-year 2017 sales will be flat to 2% higher, with per-share earnings improving by 8% to 10%. This would be due to what the company describes as the "continued momentum in organic sales growth throughout 2017, supported by strong order rates and a growing backlog across many of our businesses." 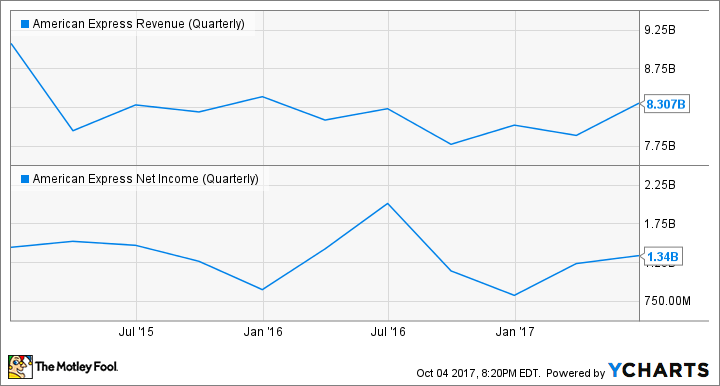 Meanwhile, both operating and free cash flow continue to be robust for Honeywell. 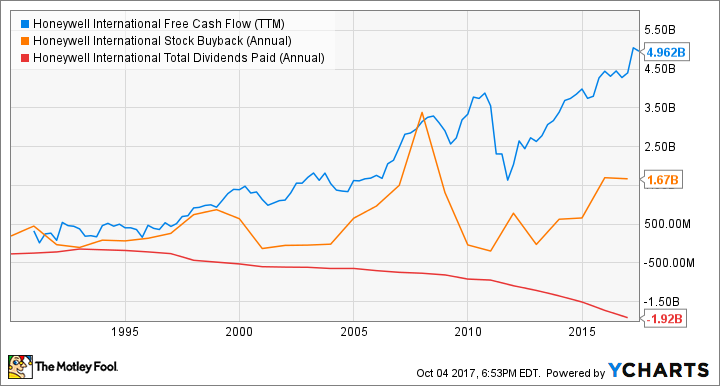 Trailing-12-month FCF is just under the $5 billion mark, providing sufficient coverage for both the distribution and the most recent set of share buybacks. The dynamic should remain the same for the raised payout. 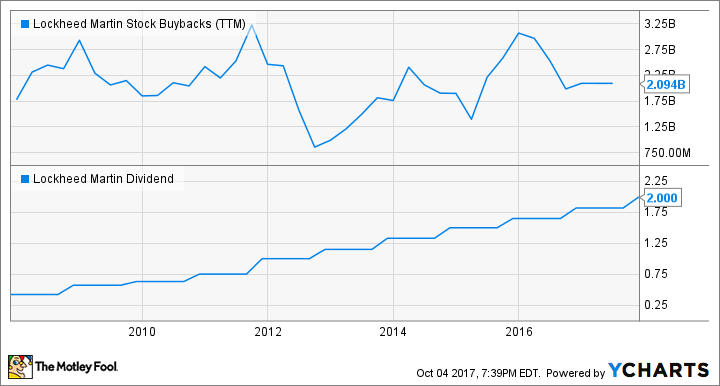 Honeywell's upcoming dividend is to be handed out on Dec. 8 to stockholders of record as of Nov. 17. The payout ratio when matching it against Q2 profit is 41%. At the current share price, it would yield 2.1%. That's slightly above the 1.9% current average yield of dividend-paying stocks on the S&P 500. Defense-industry stalwart Lockheed Martin is lifting its quarterly dividend by 10% to $2.00 per share. The company's board also authorized an expansion of its share-repurchase program by $2.0 billion, bringing the total authorized amount to $4.3 billion. The company's Q2 net sales came in at almost $12.7 billion, which was nearly 10% better than the year-ago quarter. On the other hand, net profit sank by 8% to $942 million, but that was largely due to a lack of earnings from discontinued operations -- these amounted to $122 million in Q2 2016. As with other defense stocks, Lockheed Martin has seen a steady rise in its share price on the potential of higher spending on armaments, and increased tensions with North Korea. With its state-of-the-art F-35 fighter plane, this company in particular is well positioned for both developments. Lockheed Martin has essentially been spending all of its FCF on dividends and stock buybacks; it'll have to grow the former to fund both of those rising expenditures. Operating in a nation currently on the defensive, and possessed of a sleek new warplane, the company's organic growth should take care of that going forward. Lockheed Martin will dispense its new dividend on Dec. 29 to investors of record as of Dec. 1. The new amount would yield 2.6% and represents a generous payout ratio of 62%. The company did not specify an end date for its new share repurchase authorization. American Express narrowly missed joining that gang of double-digit dividend raisers from last week. The credit card giant is boosting its quarterly payout by 9% to $0.35 per share. The company hasn't yet fully gotten over its 2016 divorce from big retailer Costco Wholesale (NASDAQ:COST), for which it was once the exclusive credit card brand accepted at the register and the co-branding partner of Costco's proprietary credit card. That's why AmEx's bottom line eroded by 33% in the company's latest reported quarter, landing at just over $1.3 billion for the period. It's also why the top line increased by only 1% (to $8.3 billion); if Costco-related revenue were taken out of the equation, that line item would have risen by 8%. The Costco split is old news; the increase in adjusted revenue is present reality. That's encouraging, as it's based on higher net interest income, and spending by its cardholders. These trends bode well for the future. AmEx prefers to spend much of its free cash flow on share buybacks rather than its dividend. Since the company is reliably cash flow-positive and can adjust the former more easily than the latter, funding the dividend increase won't be too much of a problem. AmEx's upcoming distribution is to be paid on Nov. 10 to shareholders of record as of Oct. 6. It yields a theoretical 1.5% on the most recent closing stock price; the payout ratio is a thin 24% on the company's most recently reported quarterly profit.